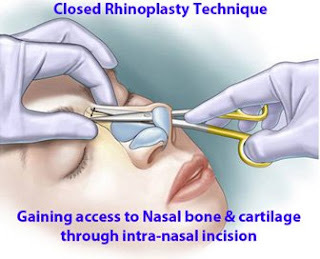 Closed Rhinoplasty is also known as Endonasal Rhinoplasty Surgery. In closed rhinoplasty, all the incision and marks are made inside the nose. Performing an endonasal rhinoplasty is difficult as the marks and cutting are made inside the nose where there is a limited view of the underlying Nasals bones and cartilage. Reshaping in such closed view gets difficult and expert rhinoplasty surgeon is required to perform such surgeries. Despite the difficulty, a well-trained Cosmetic Surgeon can achieve best results in rhinoplasty surgeries. Closed Rhinoplasty method is mostly done when the requirement is less or in small Nose Reshaping surgeries. In Open Rhinoplasty incision and markings are done inside the nose but most importantly an incision is made to make the Nose Open at the columella. Columella (Tissue Strip which separates the Nostrils and located at the base of the Nose). Through incision the Nose Skin can be lifted up and underlying cartilage and bones can be reshaped easily. Open Rhinoplasty gives a clear view of the underlying Nasal Bones which gives the surgeon a clear view to reshaping bones. 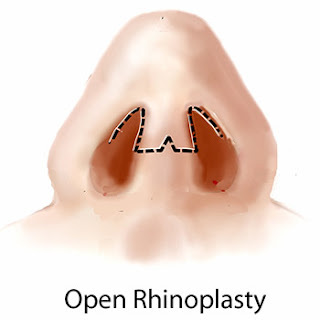 Most of the Corrective procedure is done with Open Rhinoplasty as the complexity increases and the surgeon needs a clear picture what he is dealing with and what steps are needed to be done to make things normal. As Nasal Bones structure is complex a clear view is necessary. Rhinoplasty Surgery in Delhi done with this method is very precise. A small incision scar is left at the base of the nose (Columella). This scar is invisible and goes off with the time. Open Rhinoplasty is the first choice for performing Complex Rhinoplasty Surgeries and Corrective Rhinoplasty Surgeries.